Remember way back when I posted about bringing Small Comforts? Petite gifts for no reason other than to bring a sparkle to someone's day. Something so special that it's giving is unmistakable in it's message............I am thinking of you today. It can be a happy day or a sad one, but when I saw this simple, yet sparkly idea by London stylist and author Sania Pell of the blog At Home I knew I should pass this disco-inspired idea along. 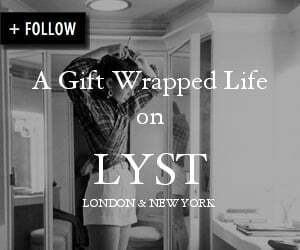 Just one of many stylish and beautiful ideas on her gorgeous site and blog gift wrapping too. Leave it on the doorstep of someone recuperating I hope your days sparkle again soon or the frazzled bride who is on the countdown to the big day Your big day will sparkle with love. You know the reasons, what friend needs a surprise bit of sparkle soon? Isn't this a gorgeous idea? It seems like our minds find the same paths at times. Just yesterday, I gathered up all of my vintage vases and selected the right one for a personalized flower arrangement. Aaron's grandmother is in the hospital and we wanted to brighten up her day. I totally agree that we should use our talents in ways to comfort and encourage those who need it. 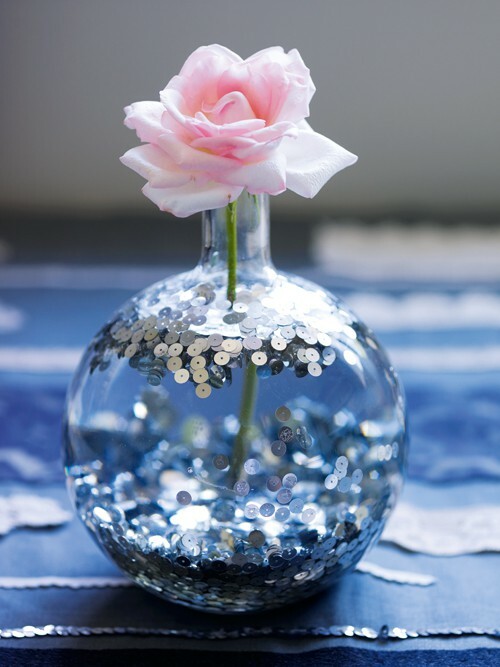 I love the simplicity of this clear vase with floating sequins...I'm making a mental note for this one, for I am sure one day someone I know will need a little extra sparkle. May this day and all the rest bring sparkles to make you smile, laugh and love. What a beautiful idea for a gift~perfect for those friends of ours who have everything! Thank you for sharing! Love this idea Sande! It is amazing how something so simple can be so big to someone's day:) Thank you for sharing another perfect gift! Thank-you for the lovely yet simple gift idea. It is going in my gift idea folder. I have a friend going into the hospital, I think this will give her day a lift!! What a beautiful idea and great picture !!! Thank you for this dash of sparkly goodness to brighten my day. I have a bud vase this trick would be perfect for! Oh you have the best ideas! I'm off to catch up on some of your posts...thank you so much for your lovely comments at mine...I always love reading them. What a fun surprise gift. There is something about our lives with all of our facebooking and tweeting and emailing, that makes getting a little surprise in the mail or on your doorstep extra special! Great inspiration, Sande - love it! This is so pretty. One of my current art projects uses oodles of sequins. If I have some left, this is what I'll do. Thanks for the idea!